The Offense — Contrary to popular belief, the Red Sox had plenty of offense last year — they finished second in MLB in runs and slugging percentage. This year’s offense is that much more dynamic — Carl Crawford essentially gives us a second Jacoby Ellsbury on the base paths, in the body of a much better hitter. A left-handed Adrian Gonzalez should bring Fenway’s right field fence to its knees, Kevin Youkilis and Dustin Pedroia are just hitting the stride of their primes, and David Ortiz is coming off a good season. There will not be a more fun offense to watch in baseball, with the Sox combination of speed and power. The Pitching — Critics like to poke holes in the Red Sox pitching staff. I look at it like this — John Lester has been just about as good as anybody the last few seasons. Clay Bucholz has finally lived up to his potential, following a 17-7 season with a 2.33 ERA. And my Red Sox pleasant surprise of the year is going to be John Lackey — I’m expecting a big season out of him. Clearly frustrated with his performance last year, Lackey arrived at camp 15 pounds lighter and ready to roll. I’d look for 16-10 or so out of him this year. That leaves us with the Red Sox perennial question marks — Daisuke Matsuzaka and Josh Beckett. These guys both have fierce stuff, but get lit up more than your average patron at a Grateful Dead concert. Who knows what to expect out of these guys — if either of them give us a season substantially over .500 we can consider it a bonus. As for the pen, Papelbon is obviously a bit of a question mark. No pitcher has ever saved 35+ games in a season to more criticism. The likes of Daniel Bard and newcomer Bobby Jenks should help sure up the closing roll. The Question Marks — The Sox have 3 questions marks in my eyes. The first is middle relief, where the Sox did do some substantial offseason work. That said, I’m not as sure of the bullpen as the rest of Boston seems to be. I am always leery of relievers — a few closers aside they are usually just pitchers not good enough to be starters. I’m not predicting anything terrible here, I’m just not quite sure who is going to emerge as the backbone of the middle relief crew. The second question mark I see is the shortstop position, which I consider to be the 3rd most important position on the field. I’m not buying into Jed Lowrie, and I never bought into Marco Scutaro. I was a big Nick Green fan myself and saw big things for him. Even so, every team has to have a weakness somewhere and I don’t think this is a big deal. The biggest question mark in my eyes, by far, is at the catcher position. Jason Varitek is valuable in his leadership and the experience he brings working with the pitching staff, but he’s a glaring weakness in all other ways and likely won’t be able to play too many games. Jarrod Saltalamacchia is young, unproven, and inexperienced — not what you’re looking for in the catcher of a World Series contender. I think that the Sox will miss Victor Martinez much more than any player that they lost — Adrian Beltre included. 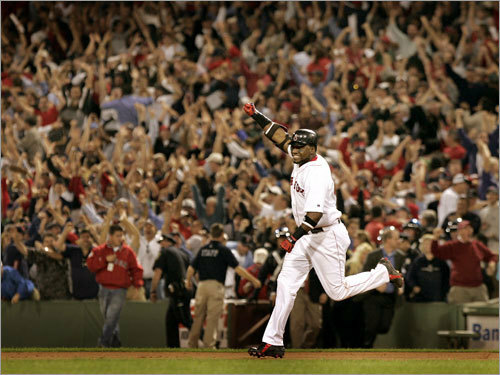 2011 Season Prediction – I’m not going out on a limb here at all, but I think the Red Sox will meet the Philadelphia Phillies in the World Series. While the Phillies’ starters are undoubtedly superior, I think that the Red Sox offense will be dynamic enough to score the runs needed to beat a lackluster Phillies offense. I hereby predict that the Red Sox will win the 2011 World Series — and don’t call me a homer — I predicted that the Yankees would win the last two seasons. 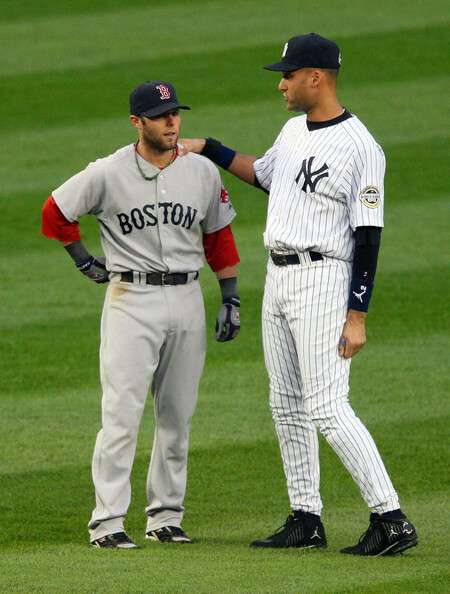 This picture really shows how small Pedroia actually is, doesn't it? 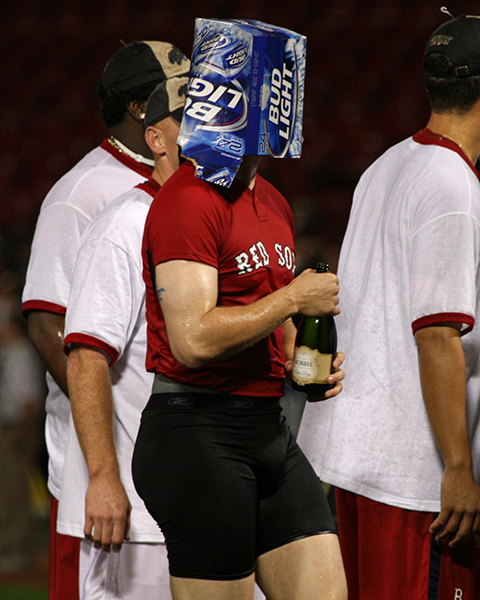 This post has been a long time in coming, but alas, there is now no way to avoid it — the 2010 Red Sox are toast. Burnt. Finished. Done. As of writing this post the Sox have 30 games to play, and are 7 games off the wild card pace. Ain’t happening. While many Boston writers wrote the Sox off as early as mid-July, I held out far longer than most. Yes, it’s partially cause I want to “believe.” But it’s not like good play couldn’t have gotten the Sox right back in it. At one point last week they were a mere 4.5 games out of first place in the AL East. But at this point, they are short on time, talent, and inspiration. As a fan its most disappointing to see that they couldn’t put a decent run together. That being said, I can’t really feel surprised. This was certainly a very interesting season in many ways. If you had told me at the beginning of the year that the Red Sox would claim Johnny Damon off waivers and Clay Bucholz would lead the league in ERA I would have given you more markers to huff. Theo Epstein chose a defense and pitching strategy which seemed strange in the AL east, yet in resulted in one of baseball’s most potent offenses and a rather lackluster pitching staff. At the end of the day, you can throw the excuse card at me all day long, but that would just be you making excuses — the Red Sox season was simply derailed by injuries. At this point Dustin Pedroia has missed 58 games, while Kevin Youkilis has missed 31 and is out for the rest of the season. Both players were off to great starts. Jacoby Ellsbury, a key offensive piece, has missed 115 games. His defensive replacement, Mike Cameron, has missed over half of the season. Josh Beckett has pitched under 100 innings, and Victor Martinez missed 23 games — during which backup catcher Jason Varitek got injured and found himself on the disabled list. And that’s just the beginning of the Sox woes this season. I simply have never seen a string of injuries this severe, which is most disappointing. Nobody wants to see the baseball season end in September. I am however happy that I feel like I can look forward to next season with a huge amount of optimism. Despite all of the injuries and widespread criticism of Theo Epstein’s pitching and defense strategy, the Red Sox are 16 games over .500. Imagine if they had stayed fairly healthy? Needless to say, they’d be right in it, if not on top. Kevin Youkilis, Dustin Pedroia, and David Ortiz are the heart and soul of this team, and 2/3 of that heart is missing. Imagine if A-Rod and Texiera were missing in New York? Or Longoria and Crawford in Tampa? It’s a scary thought. And I think Theo knows he better step up his game this offseason. So who’s going to step up and beat the Yankees for me? As a matter of fact Johnny, stay out of Boston altogether. When the Tigers come to play Boston, take a few personal days. Nobody wants you here. As a Red Sox fan (and a former Damon fan, I actually got his autograph at Fenway while he was on the Royals), I was not exactly happy to see that the Sox claimed Damon off of waivers from the Detroit Tigers. Luckily for me, Damon was a coward and feared the wrath of the Boston fans too much to return — he utilizes his no trade clause to stay with the Tigers. He said that his “psyche” was “absolutely” hurt by Boston fans — as it should be. The man proved to be a complete coward, a complete sellout. Damon “loved” playing for the Red Sox, helping them win their first World Series in 86 years. He talked about it for hours on end. He wanted to stay. Boston was his home. Then he sold out to the Yankees for minimally more money. Are you kidding me? Get out of here and never come back. Stay in Detroit and hit .270 with your 7 home runs. You do a pretty great job of defining disloyalty and greed. Now that I’m done with Johnny, let’s lay into Theo Epstein a bit. Are you kidding me Theo? You wanted Damon back? Are you that desperate? I have always defended you, and think you are just about the wisest GM in baseball. But how could you let Damon come back to the Red Sox after his betrayal? Fans will literally hurl batteries at him and boo him out of Boston. Sure, we’ve got all kinds of injuries in the outfield — but let’s not stoop this low. I’d rather than lose than have Damon help us. Have some pride, Theo. For a GM known for his patience, for once it looks like you might be panicking. Jonathan Papelbon — Closer to the End? I must start this post by saying that it pains me to be writing it. I am weeping a little bit — actually a lot of bit — and my self loathing has rarely been higher. It’s made worse by the fact that I don’t usually do this — I tend to hang on to veteran players for too long if anything. 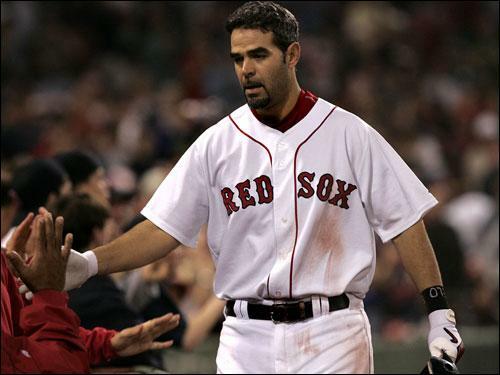 I like the Shaq trade, and Mike Lowell can hang around forever. But I think it’s time for Jonathan Papelbon to go. It hurts just saying that. The reason I’m saying we have to let him go is simple — he’s a closer who has started to blow more games than he should. Papelbon blew it for us in the playoffs last year, and he’s blown 6 saves already this year. Six blown saves is not a huge number by any measure, but it certainly isn’t ideal — especially as the Red Sox find themselves in a very tight wild card race. From a pitching standpoint, this is all very frustrating as Papelbon still consistently hits 98 mph on the radar gun when he needs to. His splitter has come a long way, to the point of possibly being the best in baseball. But other than that, he doesn’t have much — and he’s leaving his fastball up. If it’s up and going that fast, it gets out of the park quickly. Lots of pitchers, especially power pitchers, struggle with this. Papelbon has been no exception. He needs to learn to keep the ball down, or he’s toast. The worst (or best part) is this — we have another reliever in Daniel Baird who can throw 98+ mph and has a 1.89 ERA. I think Baird is our closer of the future, although he’s not half as fun as Papelbon to watch. It gets even easier to get rid of Papelbon knowing that his trade value is still extremely high — we could pick up another great arm or bat for him easily. If I was Theo Epstein, as tough as it would be, I’d be looking to deal Papelbon this offseason if a good opportunity presents itself. As for this year, I’d keep him as the closer — you don’t want Terry Francona to lose him mentally by demoting him to middle relief. Throw Baird in to close out some games, but make it clear Papelbon is still the closer. He is sure fun as hell to watch — and one of my favorite players on the Red Sox. Kudos to Mike Lowell, who slapped Red Sox owner John Henry around a bit by blasting a home run over the green monster on the first pitch he saw since returning to the Red Sox. While Lowell was busy hitting 3 home runs for the PawSox last week, Henry was actively trying to get him traded. This guy has never gotten any respect in his career — for a clutch performer and World Series MVP, he is wildly underrated. Not to mention his glove. Kudos also to Josh Beckett who pitched a 3-hit, 8 strikeout gem needing only 103 pitches through 8 complete innings. Beckett was then taken out of the game as he was busy brawling with the Indians. You can see the video on ESPN.com. Beckett is listed at 6’5 and 225 pounds — and he looked very mad. This game was a key win for the Red Sox, firing up a team that now is missing their two best players (Kevin Youkilis and Dustin Pedroia). Now is the time for them to start making a run.